The article shared details about our community that are also available here on our website like our builders, our upcoming amenities, our size and price range. We’re excited to be featured and thankful to Steve Brown, Real Estate Editor for the write-up! A new 1,000-home residential community is opening its doors northeast of Dallas. 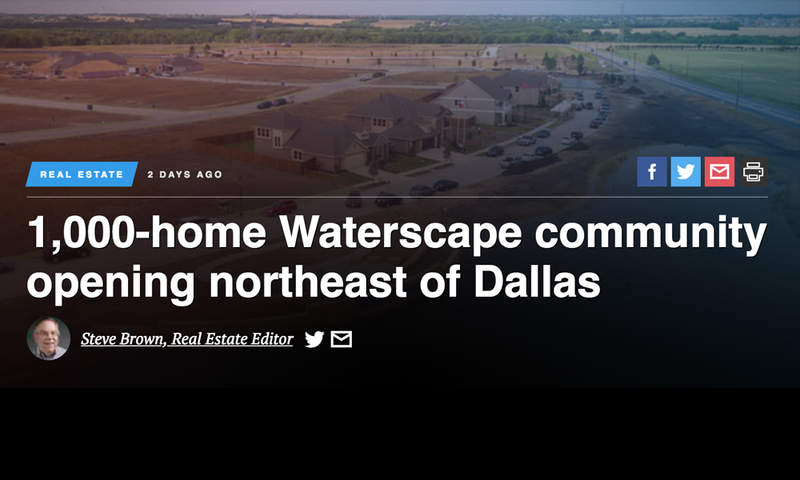 The 300-acre Waterscape project is being developed by Dallas-based Huffines Communities in Royse City. Builders Bloomfield Homes, Highland Homes, HistoryMaker Homes and Impression Homes are constructing houses in the project’s first 275-home phase. About 50 homes have already been sold. Houses in the Waterscape community start in the low $200,000s. Waterscape will include a hike-and-bike trail system and a community amenity center with cabana areas, outdoor lounge space, pools, a hammock park, outdoor entertainment, event lawn and children’s playscape. “We wanted to create a community similar to those from years ago in which everyone felt safe because they knew and regularly interacted with their neighbors,” Huffines Communities’ Colin Huffines said in a statement. “That amenity facility will be a community center; a place where families can meet and have fun. Waterscape is located on FM 548 south of U.S. Highway 67. Royse City is located northeast of Dallas and has a population of about 12,567. “Royse City is in a good location; it’s close to employment centers in Rockwall and northeast Dallas, while situated in an area that boasts natural beauty,” Colin said.